I meant to post this recipe before Christmas, hoping to catch a photo of the full batch of brownies. But in my haste to get the meal all together, I forgot. Luckily there were a couple of brownies left after the meal for me to photograph, as I’ve never seen my kids go after brownies like this. I experimented with this recipe to use flax seed instead of egg so that my daughter’s boyfriend could eat them – and I was happy to find him digging in on Christmas. You can simply use 2 eggs if you don’t have an egg allergy to deal with, or make it with the flax seed if you just want to give that technique a try. 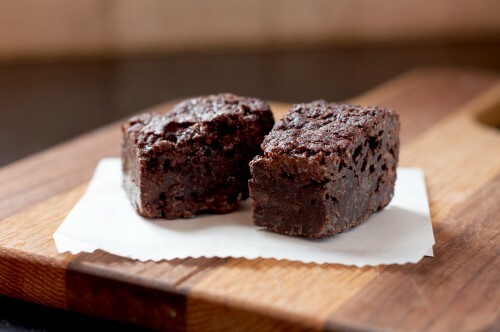 Be sure to chill the brownies before cutting them and I found that a serrated knife worked best – they will be very crunch on the edges, and dense and chewy in the center. Keep leftovers in the fridge – if you actually end up with any leftovers! Preheat oven to 375 degrees. Line an 8x8 baking pan with parchment paper on the bottom coming up two sides. Spray the entire pan and paper with cooking spray. Combine the ground flax seed with the water, stir together, and set aside to gel. Melt the butter and chocolate together in the top of a double boiler until smooth. Remove from the heat and stir in the sugars. Sprinkle the salt and baking powder over the batter and stir to combine. Stir in the peppermint extract, flax seed mixture, and the flour until combined. Stir in the chocolate chips. Spoon the batter into the pan and bake until the edges are crisp and the center is just barely cooked, about 40-45 minutes minutes. Let cool completely in the pan in the refrigerator before removing and slicing.